Sometime in the 1770s Robert Wedderburn left Jamaica and served as a sailor on British ships, as did many other Black and Coloured men at the time. He took on board the grievances of seamen of the time, especially against the brutal floggings that were customary, and added the sailor's lingo to his boyhood's 'Jamaica talk'. 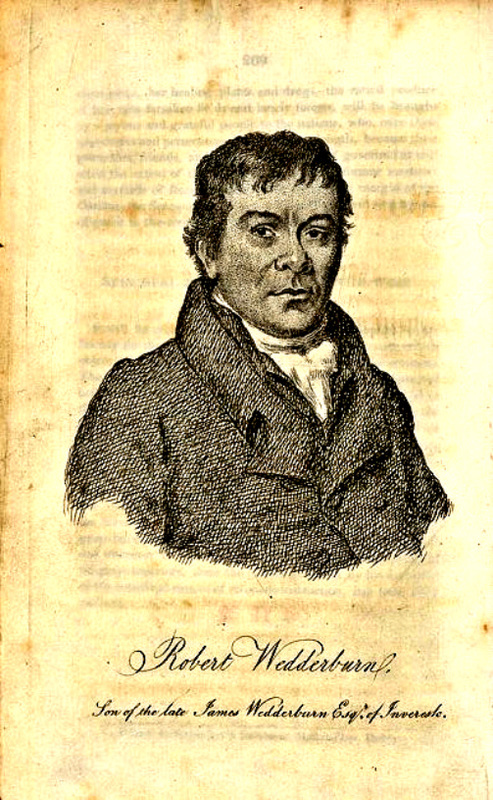 Robert Wedderburn arrived in England in the late 1770s, and in 1781 married Elizabeth Ryan, with whom he had six or maybe seven children by 1806. He earned his living as a skilled, respectable tailor, although as economic conditions declined, he was forced like other respectable artisans to take almost any sort of work available. Sometime around 1786 Wedderburn was deeply affected by the preaching of a Methodist preacher in Seven Dials, where many of London's Black poor lived. For many years he explored the multifarious theologies of the times, latterly being licensed as a Unitarian preacher. Sometime around 1800 he published a pamphlet Truth Self Supported , a rather confused attempt at laying out his religious ideas. In succeeding years Wedderburn was influenced by the ideas of Richard Brothers, an early advocate of British Israelism, whose religious ideas had a strongly political and revolutionary orientation. By 1813 he had moved to a far more political, idealogical position, aligning himself with the revolutionary Radicalism of Thomas Spence which advocated equal rights and a form of agrarian communism; Spence also linked slavery in the New World with the condition of the poor in the Old. In 1817 Wedderburn started a weekly periodical on those lines. By involving himself at this time with groups engaged in reviving the Radical revolutionary activities the authorities had hoped they had crushed by 1800, Wedderburn was inevitably bringing himself to the attention of those authorities. He became an associate of Thomas Evans, a Spencean Radical and with him formed a politico-religious group, the Christian Philanthropists, but they soon parted company and by 1819 Wedderburn opened his own chapel in Soho, presumably having obtained that licence as a dissenting preacher. Here he became increasing allied with men who represented the simmering working class discontent of the time. The Spa Fields Riot had taken place in London in December 1816, and outbreaks in other parts of the country led on to the Peterloo Massacre in Manchester in August 1819. In fear of a rising tide of apparently revolutionary activity the government passed the Six Acts of 1819 in an effort to stem that tide. Wedderburn's fiery rhetoric continued and shortly after the passing of the Six Acts he was arrested for 'Blasphemous Libel'. He was found guilty and sentenced to two years, which were served in Dorchester jail. While there he was visited by William Wilberforce and it has been suggested that Wilberforce urged him to intensify his support for the cause of Abolition; this may have led to the writing of Wedderburn's most notable work, The Horrors of Slavery, in 1824, which establishes his significance in the anti-slavery struggle. After his release he tried unsuccessfully to restart his career as a preacher, and gradually sank into desperate poverty. At the end of the 1820s he was again jailed, for operating a brothel, and after his release in 1831, he disappears from the records; he was apparently still alive in 1834, but after that, nothing more. His descendants, like so many others of Jamaican ancestry, became integrated into the British working class, and have only in recent times rediscovered their descent from this Radical defender of the rights of slaves and of working class men and women. The British Labour politician Bill Wedderburn, Baron Wedderburn of Charlton, was a direct descendant of Robert Wedderburn.